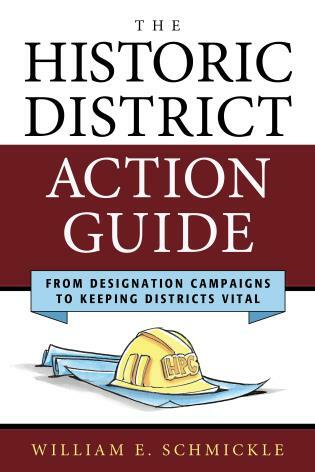 The Historic District Action Guide: From Designation Campaigns to Keeping Districts Vital is a results-oriented, straight-talking guide for local activists, professionals, and preservation commissions committed to winning and maintaining local historic districts. Its political approach focuses on the crucial challenges of gaining and sustaining community and local governmental support for historic district regulations. This how-to guide gives citizens who are fighting to designate a local historic district the political know-how to win the support of fellow residents and city hall. Everything is here: learning to think politically, mastering the political process; planning and strategy; campaign organizing and leadership; framing a practical vision; anticipating and handling the opposition; conducting community meetings; skirmishing with property rightists; managing issues, petitions, and public opinion; dealing with public officials; strategizing for public hearings; and winning the vote for district designation. Once the vote is won, the Action Guide shows how to maintain momentum in their communities once the initial political campaign to win historic preservation designation has faded and the real work of enforcement begins.